My husband leads our family in nightly devotions so we are always on the lookout for a good family devotional book. As true as this is, nothing is better than just sitting together in our living room and opening up the Bible itself and letting God speak to us through His Word. 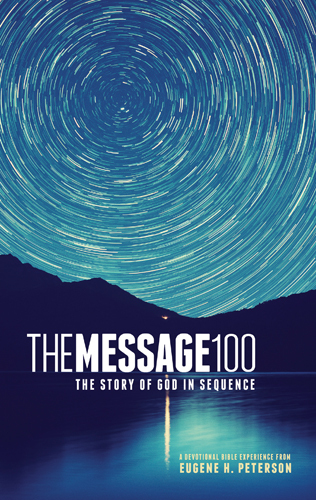 The Message 100 The Story of God in Sequence by Eugene H. Peterson is the entire Bible laid out in 100 readings that reflect the unfolding story of God as He reveals Himself to His people. That revelation continues with us today as we open the Bible and are drawn into the truths that we find for our lives. Eugene Peterson gives a brief reflection at the beginning of each reading that prepares you for what you are about to read. In the back of the Bible is a breakdown of the 100 readings as well as a page listing where to find each book of the Bible. This is a wonderful Bible that will take you sequentially through the unfolding story of God and His people! You can take your time reading through each of the 100 readings. Written in The Message version, it's easy to read so the whole family can take turns reading and even your youngest children will be able to understand what is being read. There's nothing better than reading the Bible and growing spiritually together as a family! You and your family will be able to do that with The Message 100 The Story of God in Sequence. We have enjoyed our nightly devotions with this Bible! I received a review copy from Tyndale House Publishers. I was not required to write a positive review, and the options I have expressed are my own.